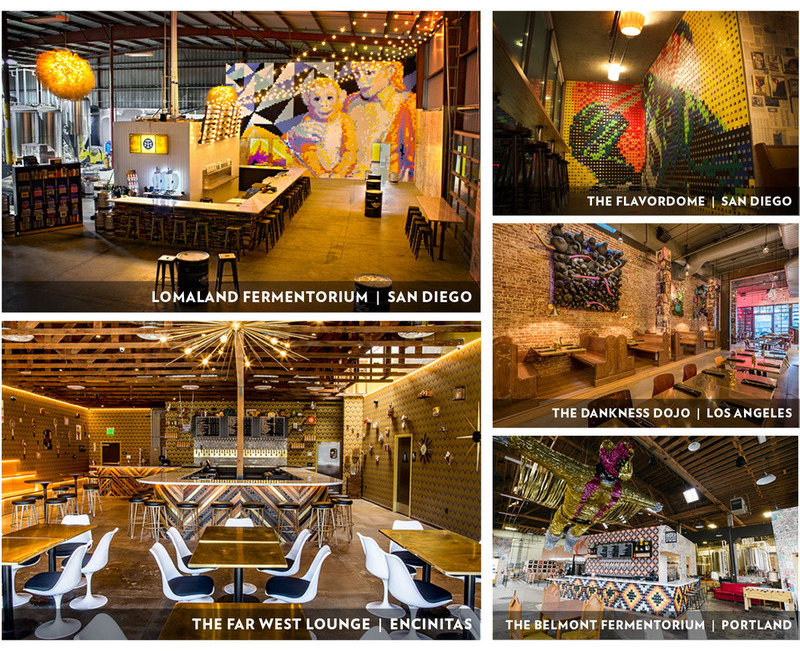 Modern Times, the San Diego (California) brewery, has initiated a crowdfunding campaign through the WeFunder platform with the objective of obtaining capital that allows them to continue expanding. Through this financing formula (crowdequity), investors will participate in the capital of a company where 30% is owned by the employees themselves since 2017. According to the presentation available at WeFunder, the brewery founded by Jacob McKean six years ago - after raising $ 1.25 million to open the brewery and a tasting room - has been year after year exceeding the expectations of its business plan to become one of the most successful breweries in the United States. In the year 2018 its revenues reached $ 30.5 M and the projection for 2019 is to reach $ 37 M.
Currently Modern Times has 5 tap rooms, 3 breweries, 3 kitchens and 1 coffee roaster, and plans to open 3 new locations this year. On the other hand, their beers and coffees are available in more than 7,000 retail stores and bars, and among their wholesalers there are companies such as Whole Foods, Trader Joe's, Costco and Disneyland, among others. The first phase of Modern Times' ambitious financing project, which will only accept up to a maximum of $ 1,070,000, will be launched on April 22, 2019 at 8pm EST. I must openly admit that publishing this post for the POURTRAITS series makes me particularly excited. Being able to talk with Joan Villar-i-Martí, also known in the beer world as "Birraire", is an absolute privilege. I personally first met Joan two years ago. The meeting took place at the BBF Pub Crawl that was held just the day before the Barcelona Beer Festival in 2016. For several hours we, together with other communicators, instagramers, and brewers visiting the city on the occasion of the festival, toured the former location of BBF (the Maritime Museum of Barcelona, inside the Drassanes Reials building) and several emblematic bars in the city. The pleasant brewing route ended in Abirradero, and I can still remember the impact it had on me when hearing Joan summarize to a group of brewers from Vermont the situation of our local craft beer scene. Simply masterful. Since then my admiration and respect for Joan has only increased. What's more, one of the things that motivates me the most to continue writing about beer culture is having the opportunity to meet and learn from people like him. As with Clark Kent and Superman, Joan is in his civil life a financial risk consultant. But when he puts on the Birraire suit he becomes a prestigious beer advisor. Among his ‘powers' is running his own blog, writing books (co-author of the 'Guia de Cerveses de Catalunya’, Editorial Base, translator of 'Craft Brew‘ de Euan Ferguson, Editorial Cinco Tintas and collaborator of ‘3rd Pocket Beer Book’ (UK) and ‘Best Beers’ (US), Octopus Publishing), collaborating as an editor in magazines (Revista Cuina, Sàpiens publicacions), presenting events and interviewing eminent personalities from the beer sector, doing tastings and beer talks of various kinds, evaluating beers in international competitions, co-organizing festivals such as the Barcelona Beer Festival, and member of the steering committee of the Barcelona Beer Challenge. Moreover, he is a member of The British Guild of Writers. Impressive, right? Having said that, I can only thank Joan for his generosity and the humility he always transmits, in what undoubtedly has meant an extremely enriching conversation washed down with good beers. Ø: Being very young, you undertook the adventure of going to work in Brussels (Belgium). What did it mean to you, and what are your memories of that experience that allowed you to get to know first hand a country where the beer tradition was - and still is - practically a religion? Joan: Recently graduated in 2007, with my suitcase full of illusion and ignorance, I set off to Brussels, with the enthusiasm I had felt for years with those 'imported beers' that could be found in certain bars and pseudo-Irish pubs here, aware of the wealth of the Flemish-Walloon kingdom in relation to beer. Except for my previous experience as an intern, this adventure meant my work debut in the finance world, but also the beginning of a hobby that over time has become my main leisure activity, and also my second job. The first night in Brussels, after taking a sip of a Kriek beer for the first time and discovering, astonished, the existence of a beer with a dominantly acidic profile, I realized that I knew absolutely nothing about what I claimed was my favorite drink. After that dose of reality, my curiosity took over and I started to discover, explore and study beer. Ø: How long have you been writing about beer and how have you managed to keep the motivation and passion intact that you transmit when you divulge the culture that surrounds it? Joan: I began writing about beer in 2010 by starting the Birraire blog in September the same year to collect my ideas, notes and experiences, although the first texts I published came out in early 2011. I always had a tendency to be prudent, and I did not think that my texts could be interesting to anyone. It was when I got to know some of the most relevant bloggers of that time, notably Jordi Expósito and Andrés Masero, when I finally began to publish content. From them I learned something very important, and something that unfortunately is missing in most blogs and social profiles related to beer that have come out lately: a completely disinterested and altruistic motivation for spreading the emerging microbrewery scene (what we now call local beer scene) so that many more people could discover and enjoy it. That motivation had its origin in the admiration of those pioneers, for their ability to go against the current, to innovate and to share. I still hang on to the teachings that Jordi and Andrés transmitted to me, powered by human fascination and the respect I feel for the people I have known all these years. Ø: Despite the controversy that may sometimes involve its denomination: when we talk about craft beer in our country it is undeniable that in recent years, thanks to the efforts of many, important and firm steps have been taken. But we have to keep moving forward. In your opinion, in what aspects do you think that brewers and / or beer communicators should and could improve in order to attract and reach the attention of the lifelong “caña” consumer? Joan: At a time when the line of handicraft or, in modern terms, of craft is blurred, in my opinion one of the keys for producers is to bet on transparency. By now everyone can with the right means make a good beer, but not everyone has a story to tell. If you can accurately explain the what and the why of their story, surely many potential consumers will find it attractive. For example, each bottle (or can) of beer carries a label in which you have the opportunity to tell relevant things to your consumers, both current or potential. Unfortunately in this sense I see many wasted opportunities: from not disclosing information in detail to understanding the beer you present, to use designs that instead of being attractive disconnect you from the product. This is just an example, but in general I think that communication is a pending issue, and more since the we, the communicators of yesteryear (mainly bloggers), have not accompanied the sector in their professionalization and stayed in the same amateur field of those first beers from more than a decade ago that are so frequently criticised. Ø: You are one of the co-organizers of the Barcelona Beer Festival, the pride of our city that breaks attendance records year after year. Also you are in charge of coordinating and directing one of the parts that I personally enjoy the most and await with great enthusiasm: the agenda of parallel activities that include tastings, pairings, presentations, meet the brewers, conferences and debates led by great professionals in the sector. In your experience during all these years, have you noticed an increase in the interest of the general public for this type of activities offered within the framework of the festival? Do you feel that people, besides drinking, sharing the moment with friends and having fun, are increasingly looking to learn about beer culture? Joan: Every year the activities of the Barcelona Beer Festival has had a faithful audience, more or less quantifiable, with many familiar faces that edition after edition were paraded through several of the different scheduled sessions. Although in the 2018 edition, the seventh, there was an unexpected wave of interest in the parallel activities that exceeded any forecast, to the point that several of the scheduled sessions were sold out within hours of going on sale, with full occupation during the Festival. The interest in these parallel activities has been growing, especially since there are bars in the city that remind you of a small beer festival every weekend. However, the attendants of the activities are in 80% or 90% of the cases already initiated, specialized and professionals: the challenge is to better reach the general public as a Festival; also in the Activities. Ø: Of all the personalities of the beer world that you have had the opportunity to meet, present or interview, who is the person who has inspired you the most? Joan: I could give you at least one name in each area of the different aspects of beer. To guide the answer in some concrete direction, I will focus on my facet as a writer. Although when forming my editorial style I have taken inspiration from many people, both inside and outside the beer industry. Surely the largest influence I have had is from the journalist, writer and beer historian Martyn Cornell. I was lucky to be sitting at the same table as him in a conference for beer bloggers held in Dublin in 2014, and since then we have met several times. He is a first class communicator, with a pleasant style despite the large amount of content immersed in each line he writes, detail-obsessed and rigorous, who pays a lot of attention to history but also to the present. He is also a great person and a great beer drinker (in the best sense possible), with such knowledge and capacity for reflection that it is a pleasure to hear him talk about beer, either live, in his publications, in different media, or in each of his books. 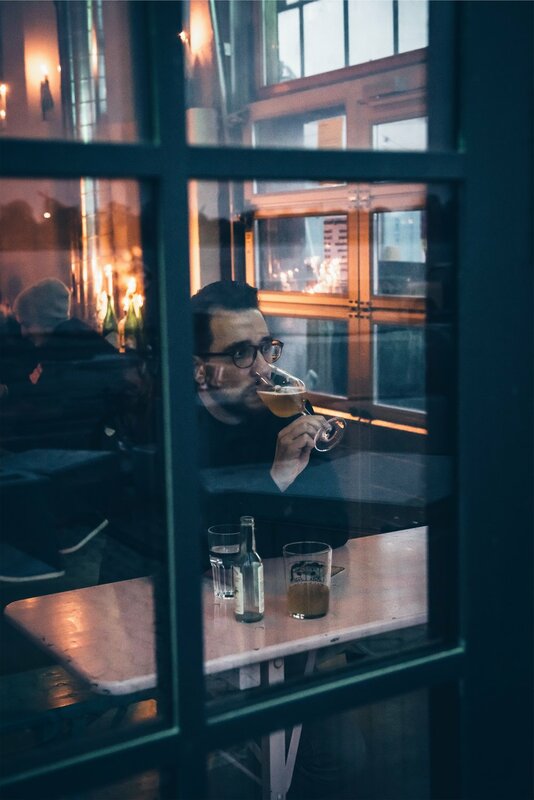 Ø: Besides writing about beer, host tastings, leading debates, making interviews and being a beer evaluator, another of your passions is reading. What three books would you recommend to these three different profiles: beginner - medium - expert? Joan: I do not like to think of the readers in terms of beginner or expert: there are books that cover the previous profiles transversally, such as my first recommendation, the essential ‘Tasting Beer’ by Randy Mosher. In my opinion, the recommendations are more in line with the preferences, reading formats and obsessions of each person. For someone who is looking for a format away from technical manuals such as prose, and a highly entertaining and informative style I would suggest any book by the English writer Pete Brown, although I prefer ‘Man Walks Into to Pub’ for discovering the more social side of the drink. To combine history and brewing tradition, and in line with my tendencies towards beers of British origin, I cannot leave out the book that for me is the best beer book in my collection: ‘Amber, Gold & Black’, by Martyn Cornell. Ø: Regarding styles: I remember that the last time we met you told me about a majestic Cask Ale that you tried during a recent stay in the United Kingdom. I know that this question is not easy, but if you had to opt for a style, would you go more towards the classic or would the scale lean towards the latest styles? Joan: When it comes to beer I am a person with classic tastes, and I have no doubt that I would stay with traditional styles. Within the traditional, despite my passion for Belgian beer, the passing of time and the social side of beer have taught me to appreciate classic British beers above all others. They are beers so full of flavor and nuance that in many cases barely exceed 4% ABV; they are designed to drink, to socialize with family, friends and neighbors; to share different moments and events. They are fragile beers that outside the ideal conditions spoil easily, but that have a cultural and social dimension so exciting that all we can do is respect, admire and enjoy them. My scale is clearly tipping in favor of those beers. If within these I had to choose a family, I would surely stay with the Mild, that masterfully combine many of the things that I like to find in a beer, and that, unfortunately, have been ignored for years. Ø: Luckily the previous question was a simple hypothesis, and as we can see from following you in social media surely at home you stock a bit of everything. From there the following question arises, how many beers more or less do you have stored in your cellar / fridge? Joan: I have 179 vintage beers in the cellar to which, to complete the stock, I should add the ones of supposed immediate consumption. There are approximately 150 beers that are fresh in the fridge, and about 80 more bottles that I keep in crates. Right now I have around 400 beers at home. It is obvious that I have a problem. In the end the reason for this is the accumulation of years of visits to stores, fairs, breweries and events without having any type of stock policy: something that I never thought I would need as a consumer of a product, but in the end it is necessary considering my activity and the fact that my beer consumption has always been very moderate. But I have began to tackle the issue, and considering that a year ago I had around 600 I am quite satisfied. Ø: As a member of the Steering Committee of the Barcelona Beer Challenge, a competition that is already in its fourth edition this year, what opinion does the level of our national beers deserve, and how do you think the professionalization, the evolution and constant improvement that we have experienced during these last years is perceived from the outside, specifically in the rest of Europe? Joan: I have always been a firm supporter of the work done in our breweries to dignify beer as a product and constantly offering improved quality. Right now we have dozens of references that have absolutely nothing to envy compared to the big names in the international scene, and from the outside you can see the large leap that has taken place. When talking with friends and colleagues from other countries, they highlight the quality of certain local beers that reach their countries or that they acquire by other means, or they speak wonders of the bar scene and the great beers offered specifically in Barcelona. We are perceived as an emerging panorama within Europe, with a huge potential but also with a long journey behind us that can already be seen in the products, and an evident growing beer culture. Ø: Finally, let me take a note of this: what is the beer that has surprised you the most lately and why? Joan: In the evaluations at the Barcelona Beer Challenge I tried a spectacular beer, but the samples are anonymous, and I do not know what beer it is. I'll be paying attention to the results! Apart from that, the last one I actually know the name of, I would choose Atorrentada by La Montnegre, a doppelbock brewed in El Maresme with the virtue of faithfully and tastefully reproducing a traditional German style, with the difficulty that this implies. Just a few months ago, when I created a Spotify account to upload some of the "Bottle Share Playlists" selected exclusively for C R A F T E D, we defined a bottle share as a meeting of people where each participant brings different beers to enjoy together with the rest of the attendees. If we think of a more sophisticated version of this type of meeting, (probably more didactic at the organoleptic level) where only beers of certain styles are chosen and in which the objective is to try (and compare) different vintages of a same beer, then we are facing a vertical tasting. Despite its name that is borrowed from the world of wines, vertical tasting is a social phenomenon with less fame when talking about beer. This is due to various reasons, but the main one is that most beers are not designed to age, but to be consumed at their peak, which means as fresh as possible. We all know that styles like Pilsner, Pale Ale or India Pale Ale, characterized by their low or moderate alcohol content, do not age well. Moreover, beers that are characterized by a strong presence of hops, both in aroma and flavor, deteriorate rapidly. The best beers to age are those that have a high alcohol content (Imperial Stout, Strong Ale, Barleywine) or a low pH level (Sour, Lambic). Also the smokey (Rauchbier) and the spicy ones (Christmas beer) are usually good candidates. As for the environment during the resting period the premises are clear: a dark, cool environment, and no movement. It is evident that we live in an era in which the styles that we usually drink are not necessarily the ones that age better. But it is also true that the more experienced beer enthusiasts show interest in deepening their knowledge, and in tasting more intense, rich and complex beers. This makes it relatively common among brewers to make these types of beer (on a seasonal basis) that are more appropriate for aging, and put them on the market. The nuances and profiles that this type of beer can gain over the years is a sensory adventure that in my opinion is well worth trying, so to all who dare: I wish you patience and lots of luck! In C R A F T E D we are always on the lookout for inspiration and good tunes to keep us company when we are enjoying our favorite drink. This is why we asked Jamie Garrett, co-owner together with Selina Heathcote of La Piña Bar (grilled cheese sandwiches and craft beer! *), one of the coolest foodie projects in Barcelona, to participate in our “Bottle Share Playlist” series. Jamie is one of the members of the hip hop/soul group Circles & Squares and a big music aficionado, so it is not a surprise that the songs he has chosen are an expression of eclectic indie, sensitivity and good taste. Thank you very much Jamie! The protagonist of this new POURTRAITS edition is Alex Lazarowicz, founder and alma mater (together with his partner and friend Dimi) of one of the most genuine and inspiring projects in the Sant Antoni neighborhood: Barna-Brew brewpub. Little would this London student of International Relations know that the year he decided to go to Brussels to carry out his internship, as well as meeting the Catalan woman who would end up becoming his girlfriend, he would sow the seed of an exciting life project. Proof of this is that after returning to London to finish the last year of his studies and completing a master's degree, Alex felt the urgent need to return to step on Belgian soil, where he ended up living for six more years, occupying various positions in institutions and organizations of the European Union. But his most enterprising vision, however, was taking shape away from the diplomatic sphere. Motivated and amazed by the country's beer culture, Alex began to study and brew beers inspired by Belgian styles. This also allowed him to establish contacts within the sector. And then it was time to take the next step: set up his own brewpub. Luckily for us, the place Alex chose to achieve his dream was Barcelona, and best of all, despite the maturity and clarity he conveys when talking about his project, this fascinating Belgian-Catalan beer adventure has only just begun! Ø: A few years ago you settled in Barcelona, but before that you left your city, London, to move to Belgium for six years. At what point did you realize that your destiny was to dedicate yourself, your body and soul, to brewing quality beer? Ø: There is no doubt that beer in the UK, besides having a long history, has strong social and cultural roots. But in your case, the passion didn’t surge until you moved to a country where the brewing tradition has since 2016 been recognized an Intangible Heritage of Humanity by Unesco. What do Belgian beers have that make them so unique and respected? Alex: It seems crazy now, but when I left the UK 12 years ago there was quite a bleak choice in my opinion: watery industrial lagers that my peers would force me to drink by the pint, or warm, flat and bland ales. Of course the ale history in the UK is strong, and I now have a lot more respect for it, but it never excited me in those days. Arriving in Belgium back then I was struck by how apart from the sheer variety, that the Belgians treated it with the respect reserved for wine in other countries. I love the depth of flavour, the added ingredients and the fact they always manage to pull off a balanced tasting beer no matter the style/strength/ingredient added. Ø: La apertura del brew pub Barna-Brew en Sant Antoni tuvo lugar en marzo del año 2017, Ø: The opening of Barna-Brew brewpub in Sant Antoni took place in March 2017, but long before that you were already brewing beers from your own recipes in places like Brouwerij Anders! or More Malta. How do you remember that first stage and when did you decide that it was time to take the next step and start brewing in your own facilities? Alex :As anyone who has done such works before, they take a lot longer than you imagine, and especially in my case as someone who had never overseen such a project. So although there seems a gap between our first beers at Brouwerij Anders! in 2014 and 2017, we always had the idea to open a brewery here. We saw our Anders experience as a testing ground for our ideas, and how the market would react. As we had both the amazing response from festivals and markets we participated in, as well as winning the the gold medal for the Moreneta Blonde at the Brussels Beer Challenge in 2014, that gave us the impetus to go forward and set up our own brewery. After that began the long story of finding the right location, financing and ordering equipment, and doing the works. 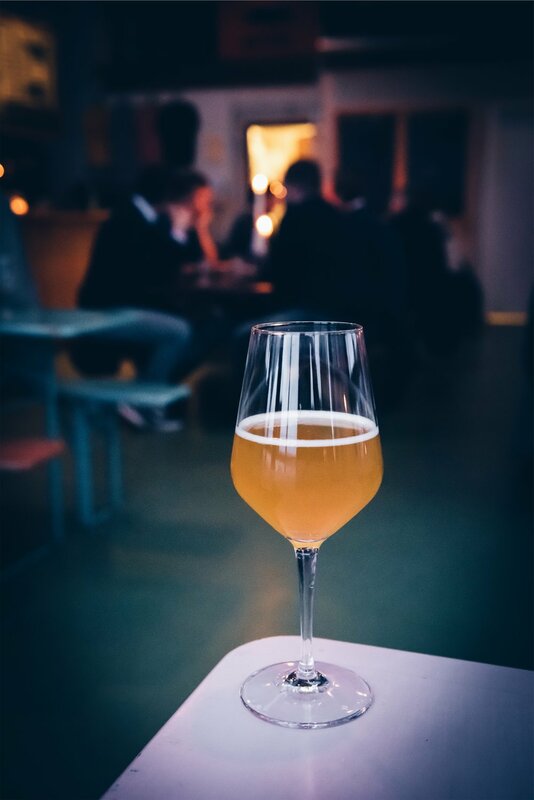 Ø: Barna-Brew has its perfectly defined leitmotif, which in my opinion is a strength that sets it apart from other proposals and increases its brand value: modern beers inspired by Belgian styles intimately connected to the local Catalan tradition. Although, on the other hand, a few months ago you launched the SantonIPA, a NEIPA in collaboration with Ratpenat Cervecers inspired by the popular American style. 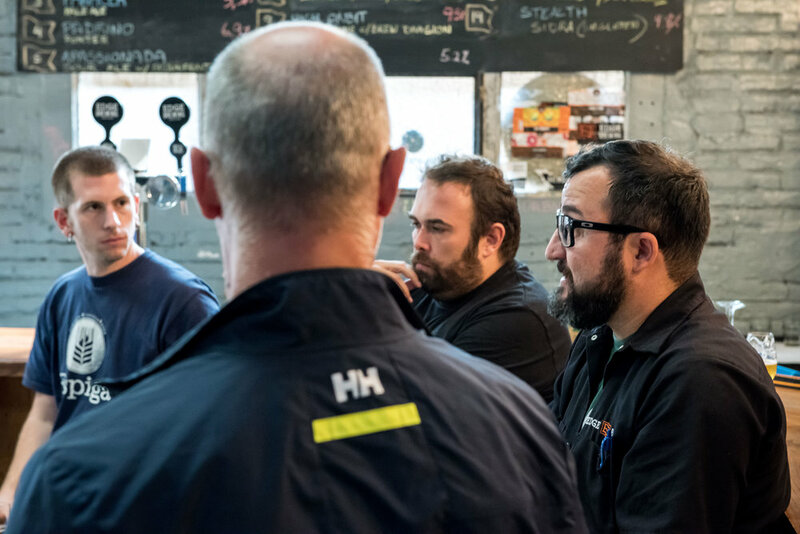 Do you think that the key to the success of any brewer lies in maintaining the balance between a recognizable and clearly identifiable line of beers without refusing to explore other proposals or styles that can be considered more trendy? Thanks for the compliment! We will always stick to our idea of Belgian style beers with a local Catalan twist - and our Moreneta series with the Blanche, Blonde and Brune will be sacred, and which we hope to distribute in bottles in the future - but obviously you have to listen to your clients, and always look to innovate. For example, we already had our dry-hopped Moreneta Blonde on the menu, and many people looking for a hoppy beer were loving it, but the amount of people asking for an “IPA” became so much we made one and called it “Ceci N’Est Pas Une IPA”, staying true to our Belgian surrealist traditions :) In general I think that the variety of styles Belgium has to offer will never limit us, and on top of that new styles get invented (A Belgian IPA did not exist as a concept say 5 years ago). Our SantonIPA was a great opportunity to work with Albert from Ratpenat who has strong links to our Sant Antoni neighbourhood. We even managed to add an ingredient which Belgians always love to do, in this case being lemon peel. As for what is the key to success, well we are happy with doing things this way, but that is not the only way- some breweries focus on having novelties constantly, and others have recognisable ranges which now they try to complement with trendy beers, and others have trendy beers and now introduce ranges of more accessible beers. Ø: When you enter your premises, you immediately feel a mixture of tradition and modernity that infuses the character of the city of Barcelona and fits perfectly with your concept. Moreover, you are located in one of the most lively and fashionable streets of the Sant Antoni neighborhood. Do you think that somehow, for better or for worse, the fact of being separated from the area of Beerxample (where most of the city’s beergeeks tend to congregate) has any kind of influence in your project? Alex: Well when we found our property Beerxample was basically Biercab and Garage, and it has now exploded even more. I think there would be gains to be had being in such a beer hub, but equally seeing some places struggle and shut down, maybe the area has reached its ceiling. Equally, we are still part of the Eixample district and walking distance from there, so we do not feel too far away. It is nice to feel part of a neighbourhood like Sant Antoni, which still has a nice feeling of barri unlike further up in Eixample. Ø: Let's talk about your award-winning beers. Apart from the classic Pils Parlament, and the different varieties of the Moreneta (Blanche, Brune and Rossa), you also brew seasonal or special beers such as La Fumée, WinterTonka or even the SantonIPA that was mentioned earlier. Of all these beers, if you had to choose one: which of them is, in your opinion, the one that in some way by its nature would best define the essence of the Barna-Brew project and for what reason? Alex: I would say the Moreneta Blonde (Rossa). It has been the start (made first together with the Blanca), hope (award-winning) and continues to be the star at our brewpub (our best seller and favourite of mine). It has everything we look for in a beer of ours: a classic Belgian style, made modern (dry-hopping), with a local twist (orange-blossom honey from El Perelló) which gives it a beautiful balance (key Belgian characteristic in my opinion) and drinkability for the local climate. Ø: Besides Barna-Brew, what other place - or places - in Barcelona would you bring a friend who is visiting Barcelona for the first time and who asks you to show him the city's craft beer scene? Alex: I will choose one from each of our neighbouring districts: Biercab because if you are a beer lover you will always find something great there, and it has great food. Brewpub Le Sec for a great vibe- love the authenticity. Ø: Taking advantage of your expertise and knowledge about Belgian beers, I would like you to name three beers - classic or more modern - that have really marked you and that any lover of good beer has to try. Alex: Only 3!? On arrival in Belgium, my first love was the ORVAL beer. I just felt there was nothing I could compare it to from all the previous beers I had had. Although I have my share of dark beers that I loved to snuggle up to on cold winter nights, I feel trying the OMER was a breakthrough for me in terms of blonde ales- fresh but with depth. Finally it would have to be the ZINNEBIR from Brasserie de la Senne. The beer that started the new-wave Belgian beers, and started using more hops. Any time I wanted something that bit fresher I went for the Zinnebir. Very unique beer in my view. Ø: If you had to choose a style, which would you choose: ¿IPA, Belgian IPA or American IPA? Alex: Obviously Belgian IPA! As I have said, Belgian mastery for me is in finding the balance- everyone loves the freshness of hops, but they are best when balanced against the malt. Ø: Finally: will we soon see any Barna-Brew beers in a bottle - or canned -? Halloween night is coming, and I suppose that you already have prepared your costumes and the craft beers that you are going to share with your friends on the most terrifying night of the year! To get you in the "Trick or Treat" kind of mood, we have created a special Bottle Share Playlist on our Spotify account. For the occasion we have selected a list of songs from the 80’s that are scarier than a barrel aged Pumpkin Ale. Although there is no official date in the calendar that marks the beginning of the fresh hop beer season (it depends on each harvest), it usually coincides with the end of summer, at the time of year when the hop flowers harvest begins and continues during the autumn months. Practically all the beers brewed worldwide contain dried and processed hops. This means that once hop flowers (or cones) are picked and separated these are sent quickly to a drying oven, or occasionally they are air dried outdoors. After this they are packaged, most of the time processed into pellets because they are easier to store and preserve, and conserved at very low temperatures, which allows to extend their useful life up to a year or even longer. It should also be noted that using pellets in brewing makes dosage easier due to their physical characteristics, and also make automatically controlled brewing possible. Hence brewing with fresh cones is a more complex process. WHAT’S NEEDED TO QUALIFY AS “FRESH-HOP BEER”? The fresh cones that are used to make the fresh-hop beers, however, are not processed. But what requirements does a beer have to fulfill so that it can be considered a fresh-hop beer? Despite the fact that there is no clear definition to what exactly a fresh-hop beer is, most brewers agree that it is a beer made with freshly harvested, unprocessed hops (which allows all its properties to be preserved) and used within 24-48h from its harvest. Thanks to this much fresher and subtle notes are obtained, and the unique herbal and floral nuances of the plant are highlighted. 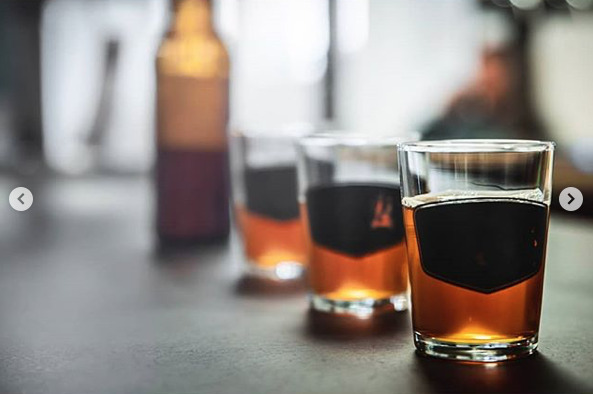 These beers must be served and consumed extremely fresh to avoid the loss of the volatile components of aroma and flavor that characterize them. Also it must be mentioned that when speaking of fresh-hop beers the styles that make sense to brew this way are IPAs, APAs or very hoppy styles such as a lager with dry hopping. Nowadays these styles are very popular among consumers. WHERE WE CAN CELEBRATE THE ARRIVAL OF THE FRESH-HOP SEASON? The fact that many brewers are not located near the hop farms, fresh-hop beers usually only are available (for a short time) in very few regions such as Oregon and Washington states in the Pacific Northwest in the US. There are even yearly events organized, celebrating the arrival of the season. Even so, it is common that during harvest time the Yakima Valley distributors, an area where 77% of the hops in the United States grow, send express fresh hops to breweries all over the world. Another highly recommended option to enjoy the sensory privilege offered by this type of beers made and consumed once a year is using local hops, which, besides contributing to the development of the sector, facilitates the transport logistics. In the case of Spain, we have companies that have been doing a great job for some time, such as Órbigo Valley (León) and Lupulina (Girona) among others. A bottle share is a gathering of individuals where each person brings beers to open and share with the other attendees. At these events the idea is simple: to share good beer with good friends. Here at C R A F T E D we want to contribute with a good soundtrack while you share and enjoy your beer gems. For this reason we have created a Spotify account in which we will upload one-of-a-kind Playlists created exclusively for C R A F T E D.
For this first Bottle Share Playlist the selection has been provided by Arturo from Mikkeller Barcelona, the protagonist of our last POURTRAITS, and the result is a fine selection of groovy hip hop beats and jazzy tunes that will make your next bottle share into something epic. ARE YOU READY FOR MASH BEER FEST 2018? Yesterday Edge Brewing hosted the presentation of MASH BEER FEST 2018, the event taking place on the 26th and 27th of October in Barcelona. The venue for the event will again be Nau Bostik, a cultural and artistic reference space located in the neighborhood of La Sagrera. After last year’s success, for this new edition a heavyweight of the sector, the American distributor Shelton Brothers Inc., has joined the project as a co-organizer along with the Catalan brewers Garage Beer Co. and Edge Brewing. So dear American craft beer lovers: hold on tight because curves are ahead..! But let's not get ahead of ourselves. MASH BEER FEST was born with the strong conviction of becoming a reference festival in Europe. Elliot Konig from Edge Brewing and Alberto Zamborlin from Garage Beer Co., both representatives of the organizing committee of MASH, enthusiastically conveyed to us during the presentation that MASH is the fruit of the momentum currently being experienced in Barcelona, becoming the epicenter of the craft beer scene in southern Europe. Like any other project taking its first steps, the objective set for this second edition is to continue growing and consolidating the festival, along with the evolution and development of the craft beer industry. MASH is not a festival conceived to make money, but rather a celebration designed, as Elliot from Edge Brewing says, by people who truly share a passion for craft beer. Although surely they must have thought: if we do it, we will do it well. When looking at the line-up of the first-class breweries that will meet in just two weeks at MASH it leaves you speechless. According to Alberto from Garage Beer Co. some of the invited breweries will actually be in Spain for the first time, so there is no doubt that their visit to Barcelona will be a unique opportunity for us to try out their creations. Moreover, 3 of them: Hill Farmstead Brewery (Vermont), Cloudwater Brew Co. (Manchester) and Trillium Brewing Company (Boston), have been recognized as the best breweries in the world according to RateBeer users. Not much to add there. Furthermore within the international section there will be barrels on tap from the United States, Sweden, United Kingdom, Iceland, Italy, Ireland, Denmark, Estonia, Poland, Portugal and Norway. All of them will be transported to the location maintaining the cold chain from their countries of origin, a much appreciated effort by the organizers. As for the national scope at MASH there will be a solid representation formed by Ales Agullons (Mediona), Edge Brewing (Barcelona), Naparbier (Pamplona), Garage Beer Co. (Barcelona), La Calavera (Ripoll), Cerveses La Pirata (Súria), Dougall's (Cantabria), Soma Beer (Girona), Fort (Barcelona), Marina (Blanes), Companyia Cervesera del Montseny (Montseny), Espiga (Alt Penedès) and Cyclic Beer Farm (Barcelona). All of which, according to Jofre Pruna from Edge Brewing, will come well equipped with the "crown jewels". A true privilege. As for the gastronomy, the tasty proposals at MASH’s second edition are Chivuo’s (Barcelona), Enkel (Barcelona), Fish & Chips (Barcelona), Fogg Bar (Madrid), HÖP Cream (Valencia) and MALTE (La Coruña). In addition to this the prestigious local brewery Biercab will also this year have a reserved space with a shop for those who want to take home a bottle or a can. In addition to drinking and eating, we all know that there is no party without good music. So, as expected, in MASH there will also be DJs warming up the atmosphere and causing occasional and improvised dance moves during the strolls from one tap to the next. The legendary Garage Beer Co. porrones have turned into somewhat of a symbol for the local beer scene. In fact, if you ever find yourself at a foreign festival and suddenly one appears in your hand, before showing the world your great talent for pouring a sour beer into your mouth from a distance, make sure to look around you first because you will surely be in a territory that has been previously conquered. The use of the porrón in our days implies friendship, festivities, celebrations among friends, and it all goes hand in hand at a festival like MASH. During this year there will also be a special stop that will pay tribute to the porrón: in exchange for a few tokens you will have the opportunity to taste the new Sour with pineapple brewed by the co-organizers Edge Brewing and Garage Beer Co. for the festival. So start practicing your beer pouring skills..! If you are planning to attend MASH BEER FEST 2018 and you still don’t have your ticket you can buy it HERE. There are two types available: Day Ticket (Friday or Saturday) or VIP All-Weekend. In the link above you can find all the information. The opening hours for both days will be from 1:00 p.m. to 10:00 p.m., with the exception for the VIP ticket holders, who can enter into the area 1 hour earlier. Keep in mind that the capacity is very limited and during the festival those who have bought their early ticket will have priority entry, so if you are certain of going, my firm recommendation is not to wait until the last moment to get your ticket! See you soon at MASH BEER FEST 2018. In Blog, Events Tags Craft beer, Mash Beer Fest 2018, Mash Beer Festival, Mash Barcelona, Cerveza artesana barcelona, Barcelona, Nau Bostik, Garage Beer Co., Edge Brewing, Shelton Brothers Inc. When speaking with people like Arturo it is easy to reach the conclusion that Hunter S. Thompson's famous quote "Good people drink good beer" is quite accurate. And most definitely in his case. Arturo Ruiz, in addition to being a great person and craft beer fan, has been one of the protagonists of our beer landscape for a few years now. All this from his center of operation: Mikkeller Barcelona, where he works as Bar Manager. Born in Venezuela, and after several years of residing in Miami, he decided to pack his suitcase and establish a life in Barcelona. Including Arturo in the POURTRAITS series of C R A F T E D is a privilege, as well as having the opportunity to chat and share a few beers with him in one of the most stylish bars in the city. Ø: How did it all start? Where does your enthusiasm for the craft beer culture come from? Arturo: When I moved to Barcelona more than 11 years ago, I only knew the big companies that produce lager beers that I could find in the American supermarkets. I always wanted to try something different, but what I didn't know is that I was always having the same style, just different brands ... And let’s not mention the quality! When I arrived here I tried some Belgian classic beers (a special mention here to Chimay). At that time I lived in Llucmajor and on my route home I passed by 2D2Dspuma, where I drank my first IPA around 8 or 9 years ago, a "Punk IPA" to be more precise. Diego, who was the bartender at this bar (and maybe still is, I have not visited them for several years!) reminded me that the last time I was there I loved the Punk, so he recommended a hoppy classic local brew at that time, "Sang de Gossa" by ZULOGAARDEN. From that point I was hooked to craft beer, and 2D2Dspuma became my usual hang out. On a separate occasion, when I was accompanying a friend who came from Norway (more skilled in craft beer than myself), we were doing a bit of sightseeing around the city and came across the Cerveteca. I loved that place and for many years it was reference point. Coincidentally 6 years ago my wife and I opened a bakery just two minutes away. The business did not go as well as we hoped so we decided to close it. At that moment Mikkeller opened, and I decided to give it a go. Thomas Rohde gave me an opportunity and since then I have been working here. Ø: A question to the home brewer inside of you: do you consider it important to know about the ingredients and the brewing process to be able to appreciate a good craft beer and enjoy it to the fullest? Arturo: I don't think it's completely necessary, but it helps to understand why a specific beer can become so sublime. Just the interaction between the ingredients … But there’s one thing I can not stand: people who are only concerned in finding flaws in beers. For me a beer is made to be enjoyed. Ø: How long have you been the Bar Manager of Mikkeller Barcelona? Ø: Although nowadays it seems impossible, at least for me, to imagine Barcelona’s beer scene without the presence of Mikkeller Barcelona, this month (November) it has only been three years since the Danish microbrewery landed in the city. What do you think, looking back, the arrival of a brewery of such prestige has meant for Barcelona, and vice versa? Arturo: I think it's an added value to the strong local beer scene. We arrived in a second wave. Places like 2D2Dspuma, La Cerveteca, Ale & Hop, George & Dragon, Jazz Brewery, Freiburg, etc. did the hard work providing the base where places like Biercab, Garage and us, among others, are present now. On the other hand we have to say that Barcelona is internationally renowned, and I think more than one beer brand would like to be present here. Ø: Mikkeller has an increasing number of locations around the world that all share the design and the cool, minimalist aesthetic that we love. Everything is well thought through, to the detail, and I think it is something that we associate with the brewery. But it is also true that in each of the locations I have visited I have perceived a unique identity. Is it important for you that those who visit Mikkeller Barcelona feel that they are in a bar in Barcelona and not just in another Mikkeller that is identical to the ones they can visit in any other country? Arturo: As you say there is a common thread within the brand, but there is something beyond the design: the people who work there. I think that the Mikkeller Barcelona team is friendly and we like to share the experience with the people who come to the bar. Not only with the staff, but also with other people in the bar. Ø: In addition to having Mikkeller beers on tap, you also have guest breweries on your blackboard, local and international. Do you have customers interested in trying beers from other brands? Arturo: This question really makes me laugh. I have had complaints that there are many Mikkeller beers on the board and that we do not have enough guest beers. I have to admit that at first it bothered me a little. But then I started ignoring the criticisms and I always try to have as much variety as possible with a couple of local beers in the mix. Ø: In the bar, in addition to your 24 taps, you have an extensive bottle menu that includes true gems. If you had to choose three bottles from that list to celebrate a bottle share with fellow beer geeks what would they be? Arturo: We would start with the SPONTANCHERRY FREDERIKSAL, then from there we would continue with the 2012 SANTA'S LITTLE HELPER aged in white wine barrels, and we would end with "Amandio" from WARPIGS, an Imperial Stout aged in Porto barrels. Ø: Another one of your beer projects is the craft beer importer and distributor Ola Chica. Could you tell me a little more about what it is? What beers are included in your portfolio and what areas do you cover with your distribution? Arturo: Well, more than being my project I would say I help out, since the work at the bar takes up most of my time. In general terms, it is the importer and distributor of Mikkeller and Warpigs for Spain. We are in a process of improving the quality and the delivery time from Copenhagen to the arrival at each bar. We have barely been functioning 2 months at 100%, but it is quite exciting to see the interest that exists throughout the territory for the brand. Ø: According to your experience and as a professional in the craft beer sector field, can you tell us your opinion on the evolution of knowledge and the growing interest in beer in restaurants and other establishments around the country that are not specialized in craft beer? Arturo: It's a process that's evolving, and it's been hard. But you can already see the results. The great example is that the big brands are betting on making styles that they did not brew before (this does not mean that they do it well), which brings consumers closer to and more aware of quality beer. Also the biggest craft breweries in the country have increasingly more international recognition, and this creates more attention when attracting new customers. Ø: What styles of beer could you never be without in the fridge of a bar or a restaurant that seeks to differentiate itself from the rest, including quality craft beer? Arturo: IPA, IPA, IPA ... it is the style that opens the doors to the world of craft beer. Although a good Kriek never did hurt anyone, hehehe..! Ø: Finally: High, low, mixed or spontaneous fermentation? Arturo: They all have their place, but if you would twist my arm I’d choose mixed or spontaneous fermentation. The "Saison Brett" by TROIS MOUSQUETAIRES or the "Arctic Saison" by GRASSROOTS BREWING (HILL FARMSTEAD BREWERY), for example. 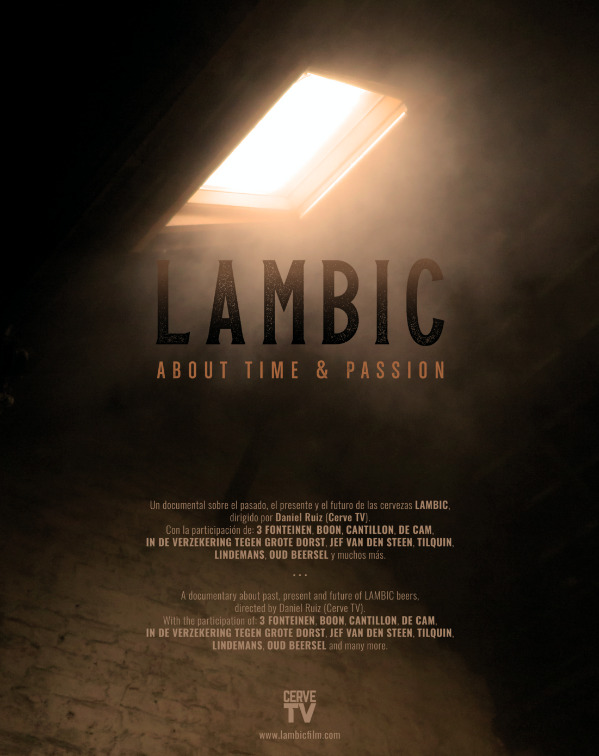 Or any classic Lambic. As for local beers, I’d choose anything from LA CALAVERA BREWING COOP. and CYCLIC BEER FARM.